Any Ideas on This Old Photo? Here is a photo I need some help with. I wonder what you think is going on here. The house in the background is my father’s grandparents’ home in Elmhurst, Illinois. The lady in the window is Dad’s grandmother, Margarethe Klein. She passed away from cancer in 1932. The only other person I can identify is my grandmother’s youngest sister Helen. She’s the young blonde at the right side of the photo, back row. Helen was born in 1910. What year do you think this photo is? And what in the world do you think they are doing? Any ideas on what brought them all together for the photo? Next week: back to my Dutch ancestors . . . This picture reminds me of a girl’s sorority. They all look to be similar in age. Did she go to college? Helen seems to be much younger than the others–by at least 5 years? And none of the others look like her sisters who would be older than these girls. I can’t figure out why they are on my great grandparents’ lawn. but they do give the appearance of a sorority. Not sure about those flowers, but are they some variety of daffodil/jonquil? If so could be a late, warm Easter. Other idea — Mother’s Day. Or could be a birthday or graduation party. Spring/summer dresses. Could those flowers work for a high school graduation time period? It’s the shoes in their hands that throws me. And is there any significance in the number 12? Or 13, with the adult watching on? The girls are all of the “fast track” or progressive strand, as their hair and dress signify. Hamming it up maybe? I wondered about their hair all being bobbed. But their dresses don’t look very wild to me for that period. Don’t they look like summer dresses from the 20s? They are quite long. I’m no expert on period dress, but these still show an awareness of new trends more than tradition. Of course, additional context would ask how urban versus rural and so on. What you have is still unlike any other photo I’ve come across. Thanks, Jnana! It looks so different to me, too. In fact, a lot of the photos from my dad’s family are quite playful rather than serious and stern. Definitely 1920s. I was thinking maybe a play or theatrical performance of some kind. The one girl in the back next to Helen, her dress with the large collar looks the most theatrical. I hadn’t thought of a theatrical performance. I always forget people did a lot more of those than we think of today. Not basketball? Did the long pearls that would get in the way give them away? hahaha Sheila, I hadn’t thought of sports because of the outfits, but they could be a sports team dressed up for an occasion. Birthday Party? What a great picture! I think so, too! I love it–their hair and outfits and the fun they are having and my great-grandmother looking out at what’s going on. I wonder who was behind the camera! It appears to me, based on the shoes they are holding, they are a tap-dancing group and the instructor is the one looking out of the window. Great photograph. Mary, dancing never crossed my mind! That’s so possible. Or maybe they were marathon dancers and showing off how they wore out the bottoms of their shoes haha. Not sure when, or what the connection of the group is, but they look like they’re about to have a wheelbarrow race (ok, it’s whacky, and I’m reaching here, but this is such a good distraction from writing a marketing strategy document). Su, that’s what some Facebook friends said on my wall today! So maybe not so goofy an idea! I can’t imagine playing with the pearls on, but stranger things have happened! Nobody should have to write a marketing strategy document haha (although I have done so). Getting some votes here for a birthday party! I think they are having fun!!! Although I don’t think it could be Helen’s since she looks like she’s just stepping in for someone, her birthday was May and this could be May. I have read about the psychology of old photographs. Cannot tell much on this one. 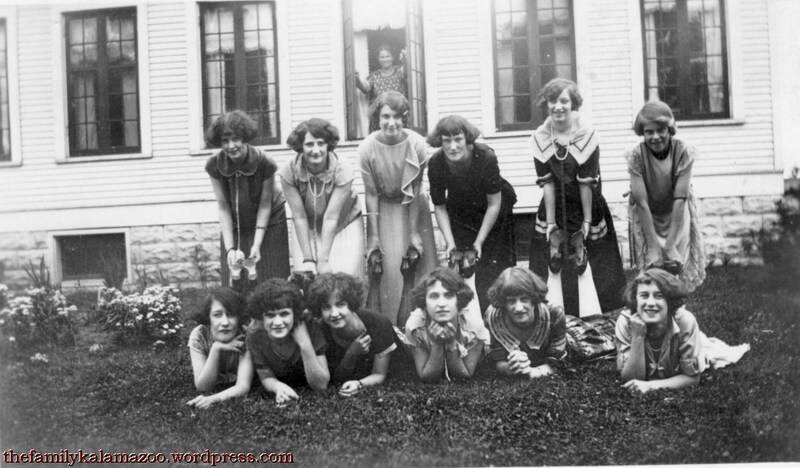 12 young woman posing for a photograph outside with a older woman inside. It was an arranged photograph. The photographer told your Dad’s Grandmother about the shot but she doesn’t feel part of this group & so posed obligingly in the background. These woman know each other well. It looks like a club of some sort? One of the woman in the front must be related to your dad’s Grandmother in some way? It was shot during the summer. You might be able to narrow that down by identifying the flower type in the background. Than find out when they bloom in that area. Thanks so much! I’m so glad you had brought your expertise from your reading (and being a photographer) to the study of this photo. That sounds just right about my great-grandmother posing “oblingingly in the background.” Good idea about the flower research! Yes, the youngest girl with the blonde hair is my dad’s Aunt Helen. Basically it’s anyone’s guess as to what was happening? You’ll never be able to prove it of course. I could speculate on this or that like everyone else,but whats the point……….we’ll never know! I only read photographs like one would read a newspaper. If you had a diary,you might be able to isolate the activity,but you’d still be speculating? If you find out,please let me know. My first thought was the lady centered – third from right in front – is your great-great Aunt Helen’s niece – and being the 1920’s – they are there for a piano recital in your great-great grandmother Margarethe’s home – which she is hosting for her (also) niece. Thanks, Dan! I’ll have to ask my dad if they had a piano in the house. Ok, this made me laugh so hard. Good way to put it. I was thinking how strange it was that they all have the exact same hair!! But then this must be very soon after the girls all chopped off their long hair, so I guess a variety of hair styles took a little time to evolve. I wonder if this photo was arranged by a local newspaper. Maybe this was a club of influential or well known daughters of prominent people in the community. EmilyAnn, that is a really interesting thought. I even kind of idly wondered if I could find something relating to it in the paper. But I didn’t think “newspaper photo” and yet it could be! I was thinking maybe they had dance shoes in their hands, or that they were about to do a pyramid so they took off their shoes…the bob was definitely hot at that time! Wasn’t it though!! Maybe those ARE dance shoes? In 1959 I went for a job interview at Elmhurst Junior? College. I was getting my Masters Degree at Northwestern in Evanston. By the time I arrived in Elmhurst I knew I didn’t want to live there. Everyone I met was perfectly nice etc. but I just wasn’t wanting a small town in the Middle West. p.s. my degree was in geography. My parents and granparents lived in Chicago and it’s suburbs for years. I was born in Elmhurst. My brother was born in Decator. My sister was born in Alton. Our family farm is in Grafton. I don’t get here very often but I love ot when I do. You have done a fantastic job of writing and sharing your family and their stories.